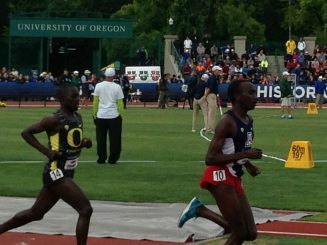 Although it was announced on Wednesday February 11th, 2015, sophomore runner Edward Cheserek was named Division I Men’s Scholar-Athlete of the Year. While this was one of the biggest honors mentioned on Wednesday, it’s also notable to commemorate the five other student-athletes that earned national academic honors. Regarding Cheserek, the U.S. Track and Field and Cross Country Coaches’ Association bestowed the nationwide academic award to him. As a business administration major, Cheserek has obtained a 3.30 GPA and joins former Oregon star Galen Rupp, who also won this prestigious award back in 2007 and 2008. During his time with the Ducks, Cheserek has been named the NCAA cross-country champion twice and has served as the pivotal leader for the track and field team. Since he arrived on campus last year, Edward Cheserek has stunned thousands by his running capability, and recently has amazed some by his academic accolade. Along with Cheserek, there are six other Ducks that are part of this prestigious list. Having six student-athletes being part of this national honor beats a school record that was previously held in 2007 where only five Oregon players won the award. Tanguy Pepiot, a senior international student from France, accomplished a 3.85 GPA as a general social science major and was ultimately placed on the men’s all-academic team. Both Cheserek and Pepiot are the only two males that were part of this outstanding list of national scholar-athletes. Furthermore, the rest of the group consists of four females that were named to the women’s all-academic team. Kansas native, Alli Cash, achieved a 3.91 GPA as a sophomore and is majoring in human physiology at the University. Annie Leblanc, the junior coming out of Quebec, finished strong with 3.68 GPA and is also majoring in human physiology like Alli Cash. Next up on the list is New York native, Megan Patrignelli, who is a senior for the Ducks and obtained 3.60 GPA while majoring in human physiology. Last but not least on this prestigious list is junior Molly Grabill, who is a junior at the University and is a sociology major. With Cheserek dominating the NCAA distance running scene, along with the other track and field Ducks mentioned earlier, there’s no doubt in my mind that Hayward Field will display an electrifying setting come this spring. As it stands, the Ducks are still considered one of the top track and field teams in the nation, along with other schools such as Texas A.M. and Florida. The first official track meet at Hayward Field will be on Saturday April 11th when the Pepsi Team Invitational will occur. It should be interesting and exciting to see how these diligent Ducks perform when they square off with other top athletes from other universities on this day.